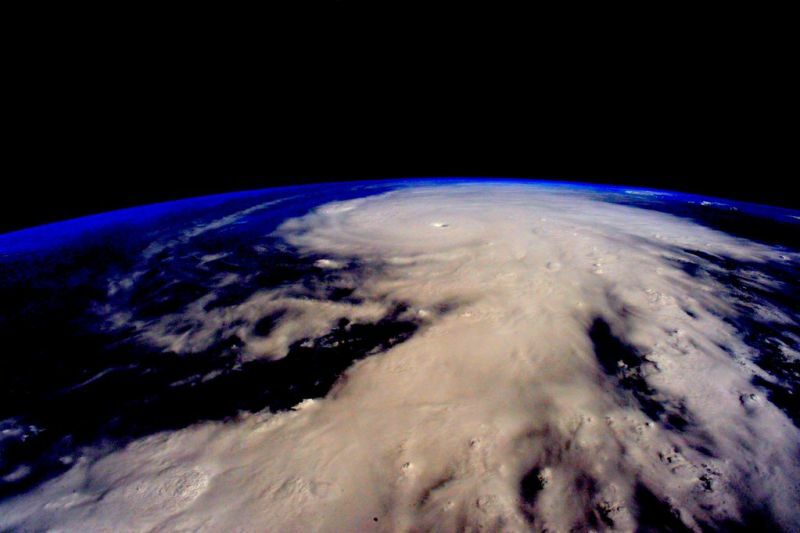 Astronaut Scott Kelly took this gorgeous photo of an ominous Hurricane Patricia swirling off the western coast of Mexico last Friday as it approached its peak, record-breaking strength of 200 MPH. The storm’s expanse of clouds is enormous, with spiraling bands of rain and thunderstorms radiating out from an iconic eye that looks like a pit in the Earth itself. That is a real image. This, too, is real. This is an infrared satellite image of Patricia near its peak intensity on Friday. 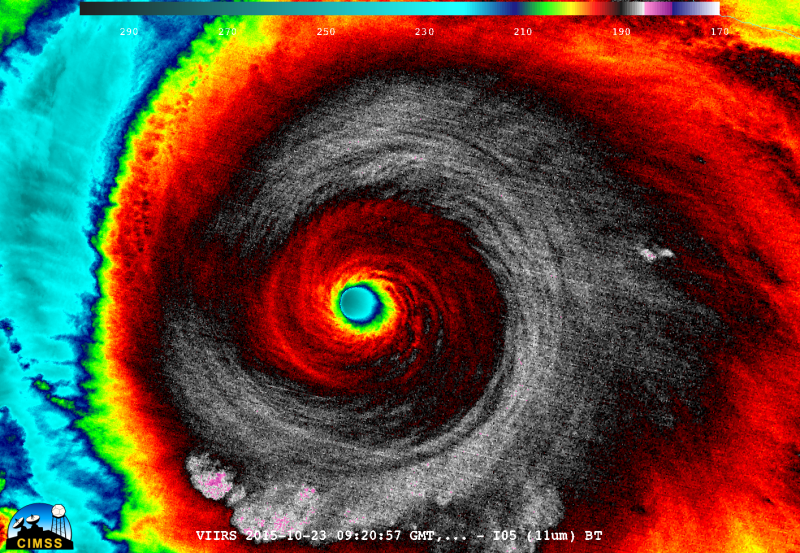 Infrared satellite images are typically shown with a rainbow color palette, with cooler colors indicating warmer temperatures and warmer colors indicating cooler temperatures (makes sense, right?). These images show us the temperature of the tops of the clouds—cooler clouds are higher in the atmosphere, the result of intense thunderstorm activity. When you see the dark reds, blacks, whites, and pinks surrounding the eye on a satellite image like this, it signals the coldest cloud tops possible, the calling card of a powerful hurricane. 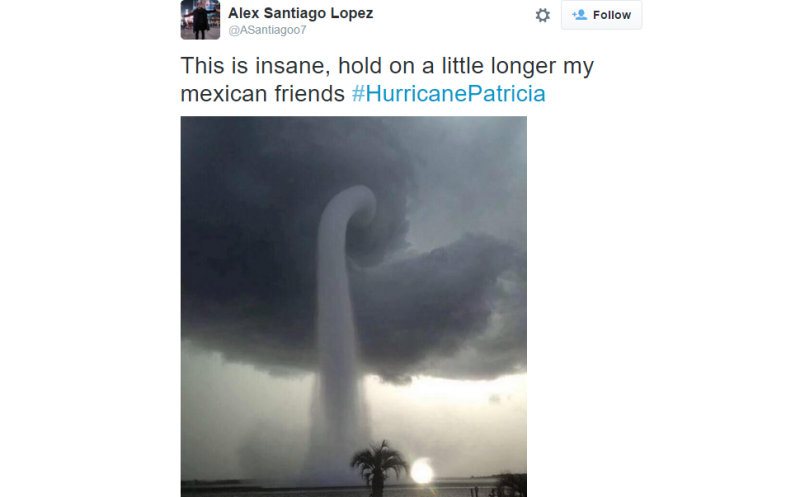 This, on the other hand, is a real picture that’s incorrectly identified at Hurricane Patricia. 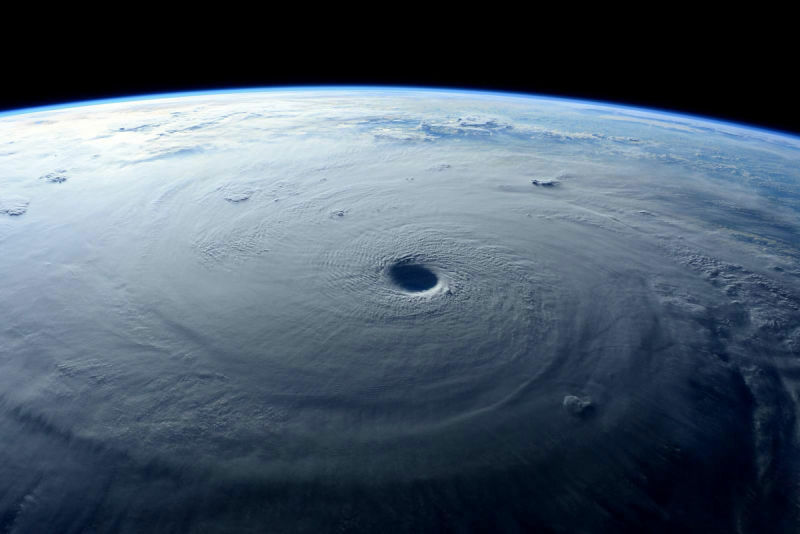 This is a photograph of Super Typhoon Maysak as it churned in the western Pacific Ocean this past March. 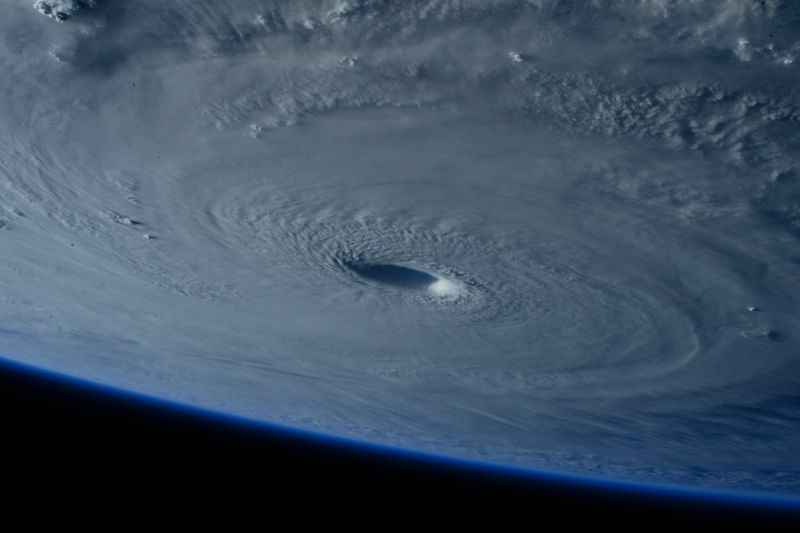 Astronauts on the International Space Station took several very impressive pictures of this iconic typhoon, including this picture and the one found at the top of this post. ...which isn’t even a hurricane!, yet it somehow got tens of thousands (if not hundreds of thousands) of impressions on Twitter thanks to some very gullible people. This is a waterspout in Florida back in 2013. This image circulates every few weeks, with people claiming it’s anything from a hurricane to a tornado to a derecho hitting Chicago. 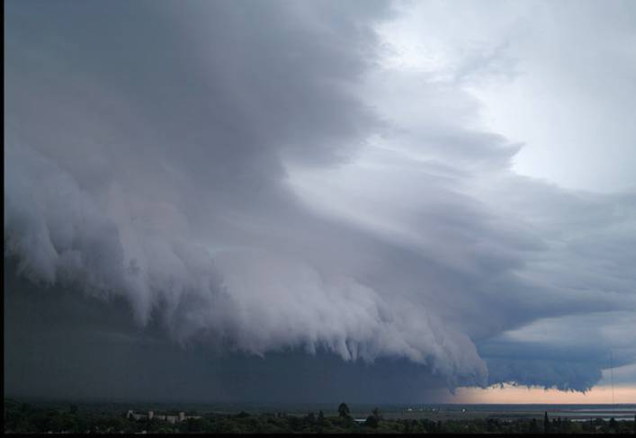 As usual, every time there’s a major weather event, people dredge up these old, impressive weather pictures as current in an attempt to build their viral reach. Sadly, it works. Dozens of pictures are floating around social media right now—accounting for hundreds of thousands of likes, shares, retweets, and favorites—from old storms that claim to show the monster off the coast of Mexico. It’s easy to debunk that email your Great Uncle Jed sent you about Obama scheming to take away our Toaster Strudels with one stroke of his mighty, dictatorial pen. 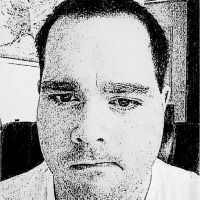 Plunk a few keywords into Google, find the post on Snopes, send along the link, and you’re done. Instant retweet, no questions asked, right? I mentioned this technique last spring when someone started circulating a photo of a “hailstone” they made in their freezer with a water balloon. It’s effective most of the time during most events, whether it’s breaking news, severe weather, or even a convincing hoax. In Google Chrome, you can right-click an image and select the “Search Google for this image” option in the drop-down menu. The browser then searches for the image in a new tab. Often, if it’s a popular image, it’ll come up with the source right toward the top of the page. If it doesn’t show you the original source, you can look to see if the picture has been published previously. If an image purportedly showing Hurricane Patricia making landfall last week, an image floating around since 2009 probably isn’t it. Some people hate Google Chrome. I get it. If you don’t use the web giant’s gateway to the internet, you can still search for images just as well. You can upload an image to Google Images by pasting a URL into the search box or clicking the upload button on the right side of the box. Same result, just a few more clicks. Everybody complains about hoaxes that spread like wildfire on the internet, but most of those people are too lazy to do anything to stop it. You’re the first defense against misinformation. Thanks to Google, it’s just as easy to check if something is true as it is to share the false article or misleading picture in the first place.